One of the county's most remote churches, stuck in a fold of fields at the end of a narrow lane in that hook of Essex beyond the Hertfordshire town of Bishop's Stortford. The church is alone in the fields, a grand sight on a rise above the Jacobean stately home of Hassiobury in the fold beneath. 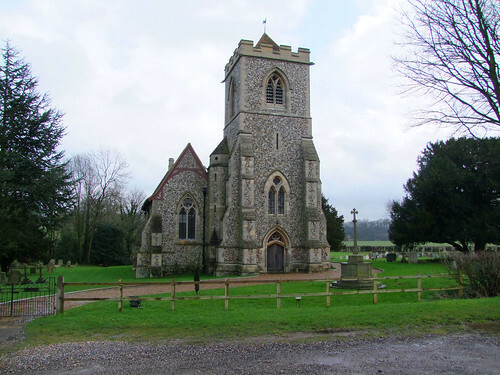 It was entirely rebuilt in the 1850s by John Clarke in a jaunty flint, with exposed beams, which cannot have been entirely approved of by the ecclesiologists. The steep roofs and exposed wood gave the effect of a gingerbread house, or at least of a church for a village of gingerbread houses. It was tempting to ring the keyholder, but the church appears to have little of interest inside, and there was only a phone number, suggesting we'd have to wait for them to come and open up. I decided that the interior could not compete with the exterior, so instead we headed on through increasingly narrow and flooded winding lanes northwards to the pretty village of Manuden.